When we considered this piece we decided to approach it in a similar way to that of the 17th century Dutch Still Life painters. The artists produced paintings in muted colour that laid bare the elements, giving them an opportunity to display their skill. Also, the paintings were often of the Vanitas theme - containing a moralistic message about the brevity of life. Our approach was therefore to remove flamboyant colour thus allowing the viewer to focus on the individual elements. 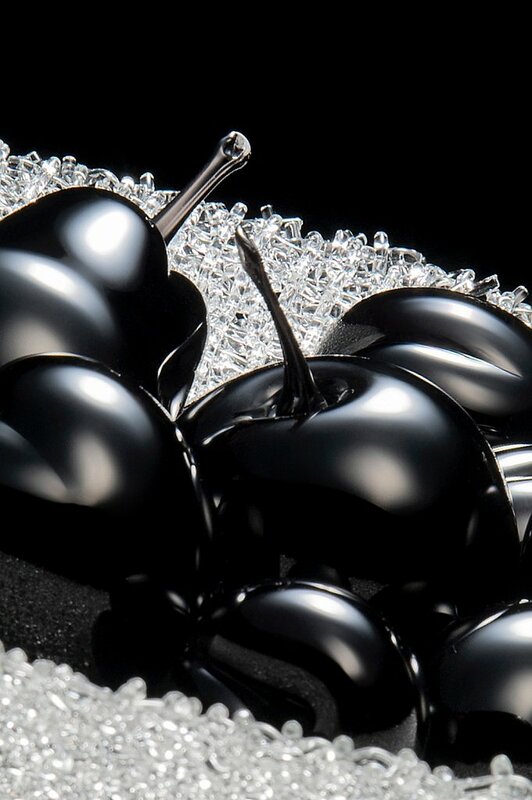 From the complexity and structure of the kiln formed woven bowl, to the sensuality and form of the hot sculpted fruit. The inclusion of the stag beetles adds a bitter-sweet message to this Vanitas piece. Symbolizing both the rebirth of the soul and the ephemeral nature of life.